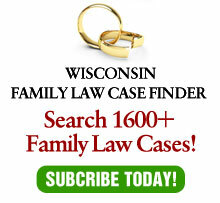 My latest column in InsideTrack, published on-line by the Wisconsin Bar Association, relates to a study done by my office on collaborative divorce. The study shows that rather than grow as a method of handling divorce cases, it has actually shrank to an infinitesimal number of cases. Not surprisingly, the column attracted a fair amount of attention – both positive and negative. The negative centered on the methodology, which was admittedly not scientific. Still, the critics missed the forest due to the trees. My editors, however, not only do not want me to write a response to the critics, but asked that I edited out any comments about them in my followup column. This is the price which I have to pay when I switched my column from the Wisconsin Law Journal to FastTrack, the publication of the State Bar of Wisconsin. In the latter, the goal was to sell subscriptions, so the more controversial, the better. On the other hand, it had a limited circulation. With FastTrack, my column gets a far, far wider circulation, but the editors are afraid of offending anyone. Well, that’s where my blog comes in, as I can write what I want. My intent in my column was not to trash the collaborative practice, which has certain benefits. It is rather to speculate on why, if it is such a substantial beneficial as advertised, it has not grown? In fact, it has shrank. That is why the critics of my column, who focused on the particular county studied, missed the point. If I had the funds to study all 72 counties, I would have done so. Instead, I chose one representative county and studied over a number of years. The critical statistic is not the raw number of collaborative cases, but the comparison over the years in one representative county which shows that the number have shrunk, not grown. The process is not necessary due to the increasing number of pro se litigants. My guess is that any of the above could be the reason, but my guess is that it is a combination of all of them. This is not to say that collaborative divorce does not have a role to play in our family law legal system. It is to say that if it is to play more than a miniscule role, it needs to examine the above possible reasons and address them, rather than attack those who question the process.